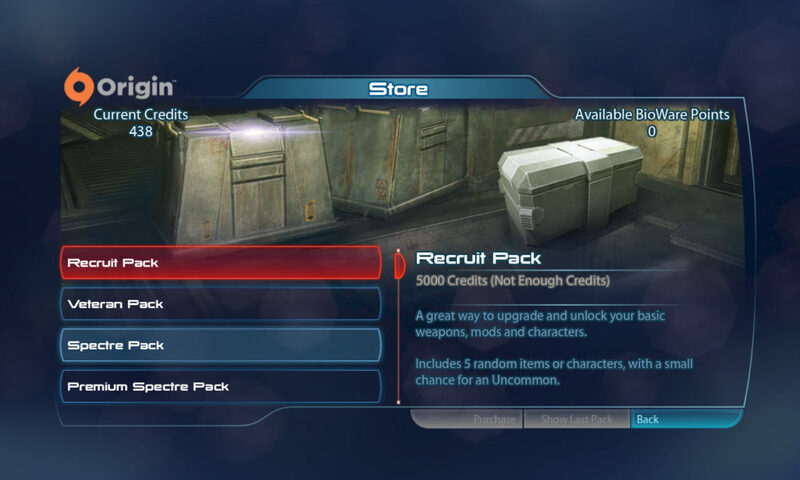 When playing Mass Effect 3 for the first time, players will find a new choice in the menu. Mass Effect 3 is the first entry in the series to have the option to play multiplayer (MEMP). It can be played alone, with 2-3 friends, or with 2-3 random players. MEMP allows for cooperative 10 round, 4 player missions in 13 locations across the galaxy. All maps are pulled from single player campaign locations. 6 additional “hazard” maps are also available to play. Hazard maps are pulled from the original pool, but with an added difficulty through environmental aspects like darkness, a snow storm, a sand storm, acid rain, a seeker swarm, and a live reactor. All maps are all currently downloadable for free. It is suggested that all be downloaded as the servers will not match players who do not have all maps with those that do. MEMP rounds have 4 difficulty levels (Bronze – Platinum) and feature 4 traditional Mass Effect enemy types: Geth, Collectors, Reapers, and Cerberus. All enemy types are AI controlled and come in specific waves, increasing in difficulty as the match progresses. The Bronze – Gold difficulty levels will feature a single enemy type while Platinum will feature them all. Players will also have 3 rounds of “mission” based play during a single match. Squad mates must work together to complete the tasks timely as well as protect each other as missions can leave players open and vulnerable to enemy attacks. These mission rounds allow for players to gain additional XP and credits which can then be used at the in-game store to purchase gear. If the fire team makes it through all 10 rounds, there is a final 2 minute evacuation round where the team must make it to a designated area for rescuse. MEMP has a direct correlation to the single player ME3 campaign in the form of War Assets. As players unlock more characters and play more MEMP, they obtain N7 levels for their characters. Once a character class (one of the six standard classes) levels up to level 20, the player will have the option to “Promote” that class to the galactic fight. More promotions leads to more single player War Assets and will aid the player into collecting enough War Assets to unite the Galaxy forces against the Reapers. Having more War Assets will also aid players in unlocking the “best” ending available for the game. Originally MEMP War Assets were required to unlock the “best” ending, but as the number prooved to be very high, BioWare lowered the total number of War Assets required and this total is now accessible through the single player campaign without players touching MEMP at all. MEMP offers the only chance for players to play as alien species. 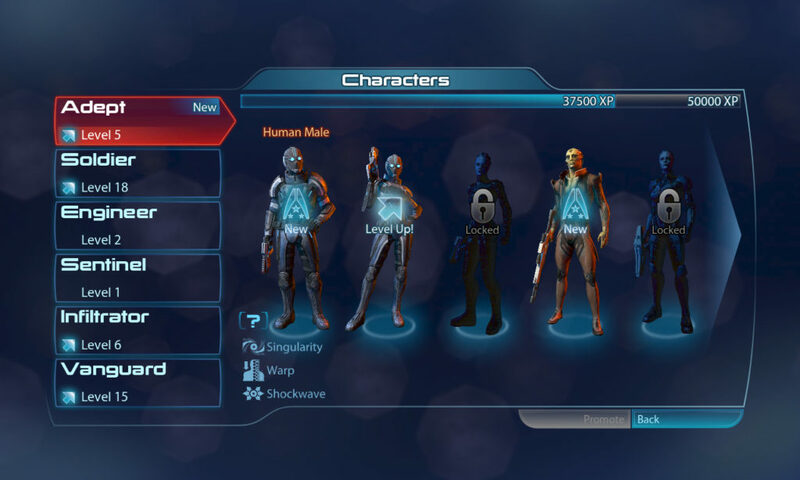 Along with the standard 6 human classes (Adept, Soldier, Engineer, Sentinel, Infiltrator, & Vanguard) they will be able to play as Asari, Turian, Batarian, Geth, & Krogan characters among others. There are also 6 rare N7 characters that have special powers and training. All characters have unique power sets and allow for extensive customization through weapons and outfits. Outside of the basic human characters and weapons to start, players unlock more content through play. An extensive library of weapons, mods, and other equipment are accessibly through the in-game store. One can play the game to gain credits to spend in the store or they can choose to spend real world money to buy credits for the store. All available purchases in the store are completely random and there is no gurantee that spending money on a specific item will unlock a desired weapon or character. Players can, should they choose, keep track of their MEMP stats through a BioWare sponsored page, http://social.bioware.com ( http://n7hq.masseffect.com/) where linking one’s profile through their game play method of choice will allow for an more in-depth method to track stats than allowed through the in-game menus.